Another alarmist and deeply misleading story about formaldehyde and e-cigarettes has now emerged in the New England Journal of Medicine: Jensen et al Hidden Formaldehyde in E-cigarette Aerosols. Short summary. This experiment, published in the New England Journal of Medicine, operated the vaping device at a such a high temperature that it produced thermal breakdown products (so-called dry puff conditions), but no user would ever be able to use it this way – the vapour would be too acrid. They went on to calculate human cancer risk from these unrealistic machine measurements and presented the data in way that was bound to mislead, which it duly did and created a world-wide media storm. This was irresponsible science, careless publishing, and credulous journalism adversely changing the perceptions of the relative risks of smoking and vaping in a way that will cause harm. The paper should be retracted in its entirety. Just before it was published, I wrote to the corresponding authors and the editor of the journal, and I would like to share my open letters. I sent this letter to the authors 12 hours before the 5pm EST 21 January 2015 publication embargo, hoping they would have the integrity to pull it. I write with reference to the forthcoming letter “Hidden Formaldehyde in E-cigarette Aerosols” to be published in the New England Journal of Medicine, under a 5pm EST 21 January 2015 embargo. 1. What care was taken to ensure that the puff regime used was a reasonable proxy for human use and exposure? The letter does not detail any attempt to calibrate the puffing regime used in the experiment to match real-world vaping behaviour. The levels of formaldehyde detected suggest it was a highly unrealistic regime. 2. What, if any, precautions were taken to avoid measuring and reporting on ‘dry puff’ conditions – i.e. through use of such high voltage and high intensity puffing that the coil becomes so hot that it creates vapour of such acrid taste and harshness that human users would not use it in that way? It is under these conditions that high levels of formaldehyde and related compounds would be expected to form – but no human would ever be exposed to them. Humans have control over the sensory experience that puffing machines do not. 3. In making your newsworthy claims about cancer risk, what confidence do have that the puffing regime used appropriately represents human vaping behaviour, and therefore human cancer risk? There is a danger that naive reporting of your findings will characterise these risks as integral to vaping products, whereas they are a feature of the operating regime, which appears to be extreme in this case. These findings are only appropriate as cancer risk communication if the operating regime is realistic. However, the letter does not detail how you have assured this is the case – and no caveat has been provided to highlight that serious and probably fatal weakness in this work. 4. 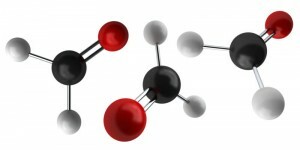 In the calculations of cancer risk, it is assumed that “inhaling formaldehyde-releasing agents carries the same risk per unit of formaldehyde as the risk associated with inhaling gaseous formaldehyde“. Can you provide a citation to support this assumption, given that the attention-grabbing findings in the letter rest entirely on it? As you will be aware, formaldehyde-releasing preservatives are used as an alternative to formaldehyde in many preparations for safety reasons. It is possible therefore that the estimation of cancer risk from formaldehyde is more complicated than your simple model allows for. This study uses a completely unrealistic puffing regime to create the conditions in which formaldehyde forms with no attempt to calibrate the machine to reflect realistic human use. That it presents results from extreme and unrealistic operating conditions which are then built into a ‘back of the envelope’ calculation of cancer risk. That this contrived and artificial cancer risk is misleadingly compared to real human cancer risks associated with smoking. That the statements about vaping having 5-15 times the incremental cancer risk associated with smoking are provided without context and could easily be misread as implying that vaping is more dangerous than smoking. It would not be the first time that misreporting of formaldehyde findings have created this impression. This study may repeat the harm done through mischaracterisation of ‘light’ cigarettes by use of unrealistic puffing regimes that did not reflect real human behaviour. The same is likely to apply here, but instead of understating risk of a harmful product, the effect will be to grossly overstate the risk of a relatively benign product – with equally damaging results. In 2010, 84.7% of smokers surveyed believed e-cigarettes were less harmful than traditional cigarettes, but according to this new study in 2013, that number dropped to just 65% [link]. This is a trend that should shame the public health community and the academics that are fuelling consumers’ misunderstanding with misleading studies that misrepresent risk. I am sure it is not your aim to protect the cigarette trade and prolong the epidemic of smoking related disease, but it may well be the effect. I hope you will take great care to ensure your findings are described in context and with appropriate caveats about whether these results are realistic for human exposure and that the calculations of cancer risk are remotely meaningful..
After emailing the authors of the study with the question above, I also emailed the NEJM – more than eight before the embargo of 5pm EST on 21 January. At this point we only had the information in the letter (i.e. not including the equipment used), so I was pressing the NEJM to ask these question of the authors and in effect to pull the release and retract the letter if the answers were unsatisfactory. I am surprised that a prestigious publication like the NEJM has decided to publish the letter by Jensen et al describing their experiment with e-cigarettes and related calculation of cancer risks. The most basic disciplines appear not have been followed, and it is likely that the test results were obtained by operating the device under conditions that no human vaper would be willing or able to tolerate. The danger is that misleading studies like like will scare people about e-cigarettes for no reason and encourage more smokers to stick with smoking – in this field especially there is a great responsibility to conduct realistic experiments, report results and caveats fairly, and not to indulge in simplistic assertions of cancer risk. I have written a letter to the authors to put these issues to them. This is below. May I suggest that NEJM editors review this letter and its peer reviews with a view to deciding if this paper provides a useful contribution or a harmfully misleading contribution to the literature. Peyton agreed with Pankow. He also pointed out that the high temperatures to which the element heated e-cigarette additives—over 600 degrees celsius—resulted in the creation of molecules not previously seen. Vaping is typically done at 200-260 degrees celsius, with dry puff conditions developing at around 280 degrees. The scientific community must realize that variable wattage devices cannot be used at any wattage levels with any available atomizer. Even for naïve users, the harsh taste of the dry puff phenomenon is unbearable. … In fact, it is very easy to produce as much aldehydes as you want in the lab with an e-cigarette device. However, this has nothing to do with exposure from e-cigarette use. When a chicken is burned, the resulting black crisp will contain carcinogens but that does not mean that chicken are carcinogenic. Without overheating the e-liquid, no formaldehyde was detected. Vaping may not be as safe as breathing clear mountain air, but it is much safer than smoking. It would be a shame if this study persuaded smokers who cannot or do not want to stop smoking and contemplate vaping that they might as well stick to their deadly cigarettes. R. Paul Jensen and colleagues at Portland State University produced the new results by overheating an e-cigarette, a condition (called dry puffing) that is familiar to vapers; the resulting product tastes so bad it cannot be inhaled. In other words, the formaldehyde produced under abusive conditions is not “hidden” at all, because it is in vapor that users find intolerable. Enough data is extracted from the authors to confirm the the measurements were made in extreme and unrealistic ‘dry puff’ conditions. Konstantinos Farsalinos has the science: Verified: formaldehyde levels found in the NEJM study were associated with dry puff conditions. An update. Dr Konstantinos Farsalinos figures out what they actually did: Verified: formaldehyde levels found in the NEJM study were associated with dry puff conditions. An update. It is more than obvious that the findings of very high levels of formaldehyde are a result of overheating. Lack of experience on e-cigarettes and no contact with vapers can result in such erroneous and unrealistic results, which can create confusion and misinformation both in the scientific community and among users and potential users of e-cigarettes. Unfortunately, the alarmist (and incorrect) conclusions of this study have already been widely disseminated in the media. Even if the information is corrected, it appears that the damage is done. I believe that the damage is substantial because many smokers will now become convinced that there is no advantage to switching from tobacco cigarettes to electronic cigarettes. Dr Gilbert Ross of the American Council on Science and Health, Poorly-done e-cig vapor study gets big headlines but means nothing. Dr Ross highlights the additional point that it wasn’t formaldehyde that was measured and formaldehyde is not an especially powerful carcinogen. This flawed study will be used to attack e-cigs as not only not safer than smoking cigarettes, but perhaps even more toxic. Nothing could be further from the truth. Those who promulgate this falsehood should be aware that even if the study were done correctly — which it was not — such a conclusion is the worst kind of destructive fiction. Formaldehyde was not even studied, in fact, but something called formaldehyde releasing compounds. And formaldehyde is a very weak carcinogen, with only a slightly increased chance of cancer among highly-exposed workers over a lifetime. The presence of one such carcinogen in vapor cannot be compared to the toxic stew of carcinogens and other toxins in cigarette smoke. A small number of journalists show they are sufficiently independently minded to challenge this alarmist drivel. Without exception the press coverage refers to elevated cancer risk. This study is so poorly designed and inherently misleading that it should not have been conducted, should not have been written up, should not have been published in the NEJM or anywhere, should not have been pitched to the media, and its findings should be completely ignored as worthless. The authors should retract the letter. If they are unwilling to do that, the NEJM should retract it. Oh but wait… it was well received and acclaimed by some in the high command of tobacco control. Vaping topography may have significant implications in production and delivery of potentially harmful substances. The EC evaporation rate and thermal load are directly dependent on the puff duration and interpuff interval. If the device is activated before the temperature is significantly decreased and/or before the wick is sufficiently supplied with liquid, the device will get overheated. This causes a phenomenon called “dry puff”. It is an unpleasant, burning taste that forces the user to lower puff duration and increase interpuff interval. It is also reproduced when the atomizer has very low amounts of liquid, signalling that it should be refilled. This phenomenon occurred in some experienced users when they were asked to use the “eGo-C” atomizer in this study. They had to lower puff duration and interpuff interval in order to avoid “dry puff”, while no such problems occurred with the “Epsilon” atomizer. Although not tested yet, there is a theoretical concern that overheating the EC may lead to production of significant amounts of toxic substances like acrolein or formaldehyde, which can be formed from thermal degradation of glycerol in a closed chamber [21,22]. The “dry-puff” phenomenon, although easily detected and avoided by the user, cannot be detected in the laboratory setting. Therefore, if this occurs during a laboratory experiment, it will significantly undermine the value of the study results and their applicability to real use. It should be emphasized that each type of atomizer has different cooling and liquid-supply abilities, depending on the design and material used. This should be taken into consideration when preparing laboratory research protocols. Farsalinos KE, Romagna G, Tsiapras D, Kyrzopoulos S, Voudris V. Evaluation of electronic cigarette use (vaping) topography and estimation of liquid consumption: implications for research protocol standards definition and for public health authorities’ regulation. Int J Environ Res Public Health 2013; 10: 2500–14. Farsalinos KE, Romagna G, Allifranchini E, Ripamonti E, Bocchietto E, Todeschi S, Tsiapras D, Kyrzopoulos S, Voudris V. Comparison of the cytotoxic potential of cigarette smoke and electronic cigarette vapour extract on cultured myocardial cells. Int J Environ Res Public Health. 2013 Oct 16;10(10):5146-62. Also, it is worth mentioning that this is not the first time an overhyped formaldehyde story has made its way into print rather than the bin. Excellent blogs by Konstantinos Farsalinos [Electronic cigarette aerosol contains 6 times LESS formaldehyde than tobacco cigarette smoke] and Brad Rodu [Formaldehype vs. Fact: Levels Are Far Lower in E-Cigarettes Than In Cigarettes] give the full story of the Japanese rogue result that made headlines worldwide. At the time, I also wrote to the author of this study, Dr. Naoki Kunugita, to point out the irresponsibility of his statements. Here is the letter from November 2014. The impression that has been left is exactly the opposite of a realistic appraisal of exposure to carcinogens in general and formaldehyde in particular that a responsible authority would wish to communicate to the public. Your remarks appear to be based on a single unpublished measurement: “In one brand of e-cigarette the team found more than 10 times the level of carcinogens contained in one regular cigarette” as quoted by AFP. Can you provide the data that supports this argument? I have been unable to locate it in the published literature. 2. not a realistic risk for human exposure. Whether or not it was the aim of your communication, the effect has been to cast doubt in the minds of many smokers about the benefits of switching to e-cigarettes, which would be immensely positive to their health. The perception of risk arising from e-cigarette use is already hugely exaggerated by the public and this will make the misalignment of perception and reality even it worse. It is not sufficient to argue that your statement was technically correct (yes, you may have a result like this). It is essential that when respected institutions and experts make comments they take care to ensure the effect it has on perception is balanced and proportional, does not spread false alarm and helps people understand the risks rather than mislead them. You have a responsibility to be both truthful and to ensure you work is placed properly in context. Given this has not happened with this statement, I am writing to ask you to make a proper balancing statement that would put this in context and restore some reality to the discussion of e-cigarette risks. I hope to hear from you soon and that you will take this request seriously – I am sure you do not want to be responsible for supporting continued cigarette use by confusing people about e-cigarette risk. Of course, as with many academics and bureaucrats, he felt no compulsion to reply or to be in any way accountable for the sorry mess he created. Formaldehyde is a byproduct generated through “thermal degradation”. At certain TEMPERATURES both PG and VG will degrade and produce formaldehyde. The trigger is TEMPERATURE, not Volts or Watts. There are 18 different variables in VW ecig that can affect temperature, and wattage is only one of them. If you really want to get to the bottom of this you need to test ecigs at incremental “temperatures” and then measure the aldehydes. I did such a test, albeit on a shoestring budget. I would love for someone with actual research funding to perform a similar test. See this article I posted. Its terribly amazing, that’s the blog you admire I likable it. I have put together this connected web site. You bought your e cigarettes amateur kits because you capital to abide the smoker experience. And with the absolute e-liquid you were on your way. Then it was time to accomplish changes and you abstruse about the 510 atomizers. Bought myself some “natural” Pure CBD crystal from CBD Wellness NM, Arrived in AUS – Report | What is CBD? Has any research been done to investigate the affects of vaping additives: glycerine and artificial sweeteners? Can anyone here provide evidence on these 2 vaping ingredients to disprove the negative affects these have on human health? Does the electronic cigarette do produce formaldehyde at 5volts or not ? -If they produce indeed formaldehyde then what are we talking about ? Can anyone answer please ?? Formaldehyde Click bait news sites with their #formaldelies stories! Here's what they aren't telling you. Gear Diary » What is Vaping? Really good to see someone sticking up for the industry and showing the media for what it is. Good work Clive, it upsets me seeing stories in the media that are blatant lies, e-cigs are a life saving device and should be praised, not shunned! How To Rebut That eCig Claim: Is There Formaldehyde In My Electronic Cigarette? It is almost as if there secret plan to kill smokers via propaganda it reminds me of an ideology in the 1930’s and 40’s…this ideology was run in part through propaganda courtesy of JG! Sadly joking aside there could almost be something in this on a deep psychological level, otherwise these people would have to be complete buffoons with a very low IQs. By analogy fears re. the research above is a bit like the situation where there is a healthier alternative to alcoholic drinks, however, some are found to contain alcohol in much smaller quantitites. People panic about this and ban the drinks with almost no alcohol in them possible they contain very small amounts of alcohol, forgetting about spirits and all other regular alcoholic drinks. Forgive me if I am wrong but the original research found that only one brand out of 6 contained high quantities of formaldehyde? I use Ecopure which does not emit any formaldehyde! I think that this research and propaganda is now becoming so anti EC that extreme bias is now explicit – it actually looks and feels like obvious fraud which it good as it exposes? Is that not illegal? 50% – more like 99% safer – it is a storm in a teacup. We will be tweeting this out great work and well done for your efforts. Is this interesting enough? (look who is funding the so called study!!! Can you guess who the sponsor is before you read it???) Of course you guessed well??? An additional rather simple, yet crucial, piece of data has been omitted from this publication. The vague “tank system” used in this experiment and repeated usage of voltage as a measure of power is fundamentally flawed by the basic laws of physics. The resistance of the coil within the “tank” nor the internal resistance of the, yet again vague, “variable voltage battery” is ever mentioned in the article. Without resistance, voltage is meaningless in understanding the actual power/heat that was supplied to the coils in these experiments. This further substantiates the obvious possibility for these numbers to exist under simply unbearable “dry puff” conditions that would have little application to the average vaper. If this article was being submitted to NBC news for the mass media to swallow, then maybe I could understand how this could fly, but how could such basic science be omitted from such a reputable journal of science and medicine? The slightly depressing thing about these idiots, is that they are wasting money that really could be better spent, and that there are plenty of real scientifice researchers who struggle every year to get enough funds to to do REAL science. Other thing that is not so good is that their Idiot BS threatens to damage the standing of all research,regardless of its merits. Thanks for standing up. As a non scientist I am happy to find somebody that says and can say what needs to be said. Thanks for this article. A lot of people out there have no clue what an electronic cigarette is or does. At this point you can tell them everything and everything will be believed. It’s one way to try and slow things down. When Oh when will these so called University scientists (who want to get on the ‘Bash the E-Cig’ band wagon) learn that misuse of the devises to get the results they crave so much, won’t work? Publishing false studies where they dry burn devises to the point of melting the bloody thing is pathetic and makes me cringe every time I read one of them. I’d love to be a fly on the wall during one of these studies! I bet it would look something like this. (Scientist) 5,4,3,2,1 and stop. Ok let’s look at what we’ve got. (Scientist) Huh! Ok let’s go again, push the button in 3, 2, 1……Ok what we got? (Scientist) Really!!!! Are you pushing the button the right way? (Scientist)Hmm Ok we’ll go for a longer push this time. In 3, 2, 1 and go. Keep going, and keep pushing. Oooow look loads of smoke going down the tube this time! (Lab Tech) Dr the button getting mighty warm now and we’ve nearly depleted the liquid reservoir capacity. (Scientist) Ok stop. Starting to smell a bit funky too. Hold on. Smells like burnt cotton. Can you smell that? (Lab Tech) But Dr there’s very little liquid in the reservoir thingy and I did notice my finger is a little sore from the hot button! (Scientist) Um, use those pliers over there. Got em. Ok in 3, 2, 1 Clamp….. Keep going……keep going. (Lab Tech) Dr there’s a weird popping sound coming from the devise and the battery seems to be awfully hot too! (Lab Tech) The coil is glowing! Oooow it’s catching on fire, Dr what should I do? (Scientist) Stop clamping,,,,get the fire extinguisher…..Good work! Right, what we got? I know it’s a bit tongue in cheek parody, but I bet it’s theme is close to the truth in some of these studies. Very amusing – unfortunately probably rather close to the truth. The truth doesn’t matter to these sorts of people. The truth has NEVER mattered to these sorts of people, regardless of whether the target is smoking or vaping. All that matters is the goal: the eradication of smoking and anything that looks like smoking. Avant de faire une étude sur les cigarettes électroniques, pourquoi ne pas faire une vraie étude sur le tabac ??? De plus, nous pouvons constater, en ce qui concerne la Belgique, une certaine infamie de la part du milieu « journalistique » (si l’on peut appeler ces personnes des journalistes). En effet, nombreux d’entre eux rédigent des articles négatifs à l’égard de la e-cigarette en mettant en avant de faux arguments que le corps médical tout entier réfute. Nous pouvons tenir le même discours concernant nos mafio$o de politicien$. En effet, comme leur copains « journaleux », ils bénéficient de grands avantage$$$ de la part des sauveurs de vie qui se nomment Marlboro, Philippe Morris, British Tobacco ou encore L&M. Quatre ont été cité mais la liste est longue. De plus, comme la plupart des gens du peuple, en Belgique, sont des barrakis ou des ignorants, ils croient n’importe quel article qu’un illettré pond dans un journal de merde. Ceci est un exemple de plus de la corruption qui sévit dans ce bête pays qu’est la Belgique, pays qui entre autre, n’aurait jamais dû exister. This morning’s Daily Mail included a balanced article on the formaldehyde issue, so maybe your message has got through to the Press. Here’s my take on this ‘ground-breaking’ research. When toasted long enough and at a high enough temperature, bread produces toxic chemicals which could make each slice up to 15 times more cancerous than untoasted bread, US researchers said Wednesday. While some say that e-toasters may help users to safely enjoy toasted bread, others are concerned that the unregulated devices are being marketed widely despite little long-term evidence about their health effects. Two piece of toast this morning… what a pathetic addict I am. Careful Clive, regular toast consumption is thought to be a gateway to chronic barbecuing dependency. What first struck me in the article was that it isn’t even a peer reviewed article but a letter to the editor, which failed to follow the guidelines for submission at that (over 400 words and 5 authors instead of 3, more than 5 references [addl ref. in the nomograph]). So skating around the integrity pond. Then a quick search of the authors discloses that two of them are key presenters at an Oregon seminar ostensibly about the impact of e-cigarettes. So there’s publication ahead of that so they can commit the baseline logical fallacy of arguing from authority. But then we get to the meat of the article. The method was shoddy to say the least, and wholly uninformative. We know that dry burning wicks will produce carbonyls and quite likely intermediates. But then to go on and do an extrapolation based on an assumed 1:1 ratio of hemiacetyls to aldehyde when this is not guaranteed, then declaring that the result is 5 to 15 times the harm of inhaling burning tobacco is senseless scaremongering. Pure junk science at its most devious and evil. Anyone with half a functioning brain (or less as reaction to formaldehyde is a limbic response) would realize that the amounts purported to be emitted would cause immediate and very uncomfortable effects on the airways and eyes of the vaper. So not only is the result of the study questionable, but the notion that any vaper would voluntarily subject themselves to such an odious phenomena is ludicrous. Unfortunately they have won, the universal law of bovine excrement applies, it will take at least an order of magnitude more effort and publicity to overcome this scatological letter to the editor passed of as real science produced on-the-fly because the authors “just wanted to get it out there”. Hat’s off to you Clive, and to Michael Siegel, Dr. Konstantinos Farsalinos, Gregory Connelly, and all my fellow vapers who have worked all day to get the facts straight. I have a suspicion that this study has been designed to scare people away from vaping in general, and from using open tank systems in particular. There has been a push by the tobacco companies making closed system cigalikes, as well as pharma companies looking to get into the market, to have open systems regulated out of the market. Open tank systems are customisable by the vaper, and may involve components from many different producers, these systems are more efficient, more economical, and allows the user to self titrate their nicotine levels, as well as the type of vape they want to achieve, eg: some prefer large clouds of vapour, some prefer stronger flavours, or their own mix of flavours, some prefer greater air flow etc etc, none of these preferences are available in closed systems. I believe this study is designed not only to make smokers more reluctant to take up vaping, but is also designed to suggest that vapers are somehow incapable of using an open system, (even though this is what the majority of vapers are using successfully). I believe this study will be used to try and have open tank systems removed from the market through regulation, thereby handing the market over to the tobacco and pharma industry. Removing open tank systems from the market will also allow governments a much easier way to apply “sin” taxes to vaping, and apply bans similar or the same as smoking bans. Some sanity out of the UK quoted in Yahoo version—–Peter Hajek, director of the Tobacco Dependence Research Unit at Barts and The London School of Medicine and Dentistry, said the study did not reflect real-world conditions. “In e-cigarette use by humans, overheating the liquid generates acrid tasting ‘dry puff’ which is unpleasant and avoided rather than slowly inhaled,” said Hajek, who was not involved in the study. “When a chicken is burned, the resulting black crisp will contain carcinogens but that does not mean that chicken are carcinogenic,” he added. http://www.reuters.com/article/2015/01/21/usa-health-ecigarettes-idUSL1N0UZ24620150121 It’s laughable, we have one item, not shown to cause cancer, but its also in cigarettes, so we extrapolated the cigarette cancer rate onto E-Cigs, ignoring everything else. “There has never been a cancer study with hemiacetals,” Pankow said in an interview.Absent such a study, the authors estimated the formaldehyde-related cancer risk associated with e-cigarettes by extrapolating from data on formaldehyde in cigarettes. Just get it out….toss it out there, WTF, we be scientists! Even if the data was collected properly, which is doubtful, it would still be a scientifically fraudulent conclusion, with clear bias evident. Associating cancer to something that has not been established as carcinogen, and then using a ratio to E-Cigs, to publish a causal connection conclusion, premised on on that….amazing. The could have collected any data, and it still would not support their theorem. At the time of the Japanese Fear Mongering more carcinogens found in ecigs hype the Japanese government was under pressure by the tobacco interests there about ecigs ruining the market for them. These bogus fabrications were never supposedly intentionally be directed for any world wide audiences but were simply translated and republished by the other No Ecig activists usually backed by Big Pharma interests for rehashing the Big Fear and Worry tactics of false information being spread like antifreeze found in ecigs? Total Bull naturally! The site has free online calculators for simpilying things a bit. But if you use the Ohm’s Law mathod for manual calculation you end up seeing 4v times 4v equal to 4 squared or 16 then divided by the current of 2.22A or 2,220mA to arrive at 7.2072072072 watts instead. Likewise while everything in life has risks such as developing an allergy to PG(Propylene Glycol) or some flavoring perhaps as I know someone allergic to Strawberries compare that to the known harm seen with tobacco smoke! That is factual and well established. The formula for calculating wattage via Ohm’s law is voltage square divided by resistance, not current. When calculated correctly, you get 4 times 4 or 16 divided by 1.8, which gives you 8.8888888 watts, just like the online calculator does. Well done to Clive and all others who presented good reasoning why this study is the usual agenda-based commercially paid-for rubbish. It could also be pointed out that there is no such thing as ‘high voltage’ vaping, since ultra low DC voltage batteries are used. The highest voltage commonly seen is 6 volts, with 8 volts occasionally obtained. The study mentions a reference voltage of 3.3v, with supposedly anomalous results obtained at 5 volts, which is 1.7 volts higher. This is not ‘high voltage’ by any definition. *High power* vaping is possible, using very low resistance atomisers, but that is a different thing (presumably). Since we don’t have any of the precise technical details needed to evaluate either the protocols, the data or the results, all that can be reliably stated is that the authors appear not to have the smallest knowledge of electricity or indeed vaping. Normally a complete lack of even the most basic knowledge of a subject is considered a barrier; in the world of Public Health it is probably an advantage. This is a study to ensure that smokers keep on smoking. It is in the interests of Governments and the Tobacco and Pharmaceutical Multinationals that they should. Anyone who supposes for one minute that people are more important than profit or revenue is seriously deluded. Having been demonized and ostracized as smokers, on the strength of dishonest, paid for research, could we now face up to the fact that we will have to risk being criminalised in order to save our health. I’m more than prepared to do just that – and so are millions of vapers world-wide – while the real criminals, and we all know WHO they are feast on the fat of the land at the expense of the tax-payers of every country. Formaldehyde – just look at the painstaking research of Dr. Farsalinos to see what a lame duck they’re bringing to the table. Just a bunch of highly paid rogues! The results of this study appear to contradict previous studies. Those differences need to be resolved before there are public policy changes. The temptation to short cut the scientific process is not because of a public health emergency, it’s the prospect of a financial emergency if tobaccco sales start to collapse instead of merely decline. any vaper who has been on ecigs for a while instantly recognises a dry hit…..then you investigate the problem and fix things, NO ONE would continue vaping on. 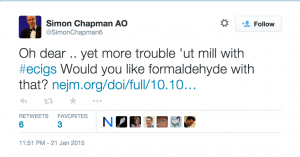 A formaldehyde “hit” would be even worse……simple fact?……no vaper would continue, they would Fix the problem! Politicians and policy makers care only about their need to justify any ecig policy. Ecig policy isn’t going to cause a massive stir unlike the poll tax for the simple reason that vapers represent a silent majority. Proper scientific study and facts have long been discounted for the simple reason that they do not prove or justify their “desired” policy regarding ecig use. Disruptive technologies such as ecigs aren’t welcomed, especially when the largest financial beneficiary of tobacco smoking are the same Govts looking to regulate ecigs. Subsequently, if the facts aren’t wanted then they fabricate studies that serve to prove their objective. Their minds are, I believe already made up and the historic cherry picking of scientific studies within policy making decisions (the TPD/WHO is a good example)serves to illustrate this fact. Unless further legal action can be implemented or the ecig opinions of the general (non vaping) public made more prominent and vocal, then politicians will simply ignore the facts or unwanted scientific proof. The general public need to support vaping because of the moral benefits of saving smokers’ lives and I do wonder if more emphasis needs to be placed on this? It is eminently possible to use a power controlled ecig as an aldehyde production facility. Anyone with the knowledge of chemistry and physics knows that these aldehydes are produced at a given temperature, and can then, very simply, engineer ‘test’ methods to replicate the desired outcome. A relatively dry wick, with the correct formulation of ‘juice’ and a high enough temperature will consistently produce as much aldehyde as the ‘tester’ desires. This is not news. Neither is it scary. It is mere fact. That the resulting aerosol would be physically painful to inhale – not throat hit, but searing, agonising pain – is what prevents anything more than fleeting exposure in any vaper, be they experienced or complete beginners. I am in no doubt whatsoever that this ‘experiment’ has been designed precisely to achieve the results it has. It cannot have been otherwise. An ethical researcher would have gradually built up power, precisely replicated actual vaping conditions, and noted, for the benefit of vapers, under what ‘normal’ conditions accidental exposure may be a risk. Patently, that is not what has been done here. For what it’s worth, should anyone want to see aldehydes being produced, they can do it. However, they absolutely WILL need to minimise airflow, else, at the temperatures required, they WILL cause combustion of the liquid. This is not supposition. Such aldehyde production can only be done in sealed, non-open systems with low airflow without combustion. OOOPS! Dated 2014. Easy mistake at this time of year I suppose. I’ve only just managed get into the right century, getting the year right in January is a big ask! Excellent as always. Especially as you have this out before the publication. Thank you, Clive, for getting this letter out before the offending study is published. I just hope that people will see them at the same time because of the potentially high damage to vaping that a this poor science could cause. I for one will be posting a link to your response/letter everywhere I see the offending ‘study’ published. This “study” is just the same old bovine excrement reloaded. Gilded by a journal. Freaking Formaldehyde again and again. Even light scratching at the surface reveals the rotten core. And that stench will cling to the journal. Worse than the mythical “3rd hand smoke”. I have to agree with Adam here. From what I have seen, it’s aim was to produce highly negative attributions in regards to ecigs for the sole purpose of propagandist information. Call my tinfoil hat ugly if you must, but without understanding firstly HOW we vape, how are they capable of producing real world results? When the earlier negative formaldehyde study (Kosmider et al) came out I believe it was the case that they didn’t understand that the puff regime was unrealistic until it was pointed out to them later. Leon Kosmider was keen to do a follow up study with vapers advising on methodology but that never materialised for some reason. That was almost a year ago and since then we’ve had the Japanese study, which was similarly debunked, and now this. There is no excuse for such ignorance now and in fact I don’t believe they are ignorant – it’s deliberate. So well done to the authors – you’ve proved that if you literally fry e-juice it produces something that may or may not have a carcinogenic effect on a human – where you would find a human stupid enough to do it will probably be the subject of a future study (once sufficient grant monies are received, natch). As Clive has pointed out the real effect of this letter and the inevitable shoddy reporting which will follow will be to further decrease the confidence which smokers have that vaping is a safer alternative to smoking and so discourage them from switching. That, in my view, is immoral. It looks to me that the ‘tests’ were engineered to achieve a predetermined (required) result. Thoroughly damaging and unethical, how long can this kind behaviour be allowed to continue without legal challenges? You are amazing. Thank you!! I cannot begin to express how refreshing it is to read your correspondence with these pillocks. I am an IT engineer by trade, I see the world as I do my users (with the greatest respect), basically sheep. Please don’t scare my sheep. Try to scare me, I can actually do something about it and I’m always interested to listen.. until you talk for a 5mins or so and tell me absolutely nothing. A message popped up. What did it say? I don’t know, I pressed okay. Five minutes later your manager will call. He has half the info you did and twice the temper. Sweet, this is going to be a super productive day! I mix my own juice and I vape it hot. Sigelli 150W box mod. I’ve been vaping for years and I was genuinely shocked to find that it actually attracted more angry ill informed folk than the servers I’ve built. Seriously, seriously crazy ..let’s say conversations. You know they blow up right? Yeah, that’s why in bought it. You know if you turn your lighter on yourself you’ll combust right?..